Today is the day that American income taxes are due. For those of us who have been struggling with numbers all weekend, I decided that a very indulgent treat was in order. Enter: In-The-Black Bottom Cupcakes. The recipe I found was already vegan, thanks to master baker Fran Costigan. The changes I made were for high altitude. I reduced baking soda for altitude and added non-dairy milk for dryness. Then I reduced the oil because high altitude baked goods can get oily and the filling could make it heavy enough. These decadent cupcakes are just what my brain and tummy needed. Mix chia and water and set aside for a couple of minutes. Mix with a fork until thoroughly combined. Repeat twice, 5 minutes apart. In a stand mixer, beat together cream cheese, sugar, and vanilla. Add chia gel and mix on medium for another 30 seconds until incorporated. Stir chocolate chips into the filling. Refrigerate in a covered container while you make the cupcakes. Position a rack on rung just above the center of the oven and preheat to 350F. Lightly oil the top only of a 12-cup cupcake tin and line with paper liners. Put a wire mesh strainer over a medium bowl. Add all-purpose flour, pastry flour, granulated sugar, cane sugar, cocoa powder, baking soda, and salt to the strainer. Stir with a whisk to sift ingredients into the bowl and whisk to aerate. (If very small bits remain in the strainer, add them to mixture in bowl.) In a small bowl, mix almond milk, oil, vinegar, and vanilla until thoroughly mixed. Immediately pour into dry ingredients. Whisk hard until batter is smooth. Fill cups just over half full with batter. 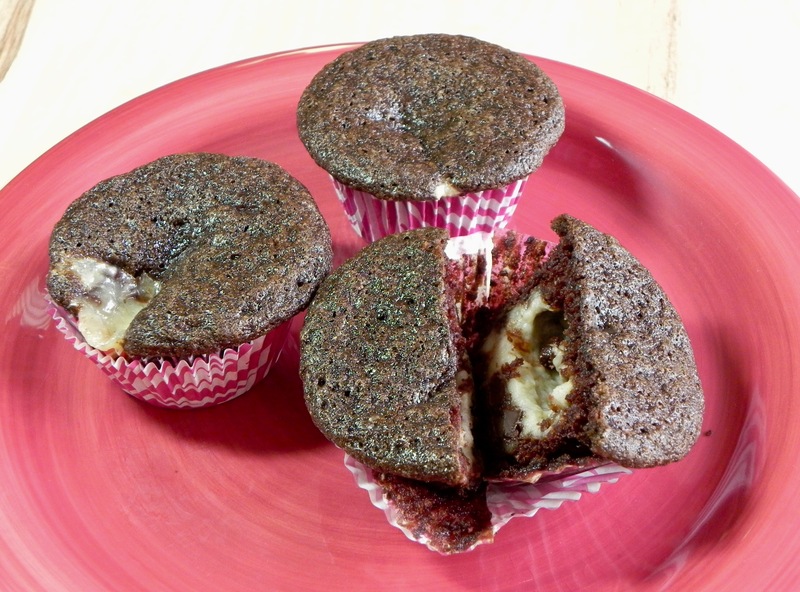 Scoop 2 tablespoons of filling into center of each cupcake. Bake for 25 to 27 minutes, or until edges are firm when lightly tapped and filling is set. Set tins on a wire rack for 10 minutes. The filling will collapse into cakes while they cool. Remove cupcakes from tin, and cool completely on a wire rack before serving. Refrigerate in an airtight container for up to three days.